MVYouth, founded in August 2014, has renewed over 90 percent of its original founding donors, securing four more years of generous support for Island youth. As a result of adding new founders each year, the group now consists of 65 couples and individuals, a 50 percent increase from the original group in 2014. According to a press release, these founders each pledge four years of support, contributing $25,000 annually to support MVYouth’s two programs, grants and scholarships. In addition, each founder pays an equal portion of the organization’s trim operating budget, ensuring that 100 percent of all contributions directly fund the Island’s youth community. The 45 donors from 2014 made their fourth and final contribution to their original pledges this summer. MVYouth’s trustees reached out to each of these donors to gauge their interest in recommitting to four more years. “We are delighted to have so many of our original donors recommitting. It sends a strong message of confidence in our organization, and allows us to look ahead for four more years of supporting Island kids, teens, and young adults,” says Jim Swartz, co-chair of the board of trustees. MVYouth administers two programs that benefit Island youth — expansion grants and scholarships. Seventy percent of MVYouth’s funds are directed to the expansion grant program supporting Island organizations devoted to youth. Thus far, these grants have supported capital expansions that will result in greater numbers served and more efficient operations, allowing selected organizations to accomplish their next big project without undertaking a lengthy capital campaign. MVYouth has supported seven organizations in its first three years of operation. In 2014, expansion grants from MVYouth built a headquarters for the Island Wide Youth Collaborative on the M.V. Community Services campus, and completed the construction of Penn Field, headquarters for Martha’s Vineyard Little League. With support from MVYouth, in 2015 the Boys & Girls Club renovated their aging facility. The Skate Park Association completed its park, and the Martha’s Vineyard Chamber Music Society bought 20 violins and violas, expanding its instrument-lending program, and funding an artist-in-residence program. In 2016, the Martha’s Vineyard Ice Arena received an expansion grant to renovate its failing structure, and Felix Neck Wildlife Sanctuary built a four-season barn and headquarters for its burgeoning camp and education programs. Thirty percent of MVYouth’s funds are directed to scholarship programs. College scholarships from MVYouth offer four years of last-dollar funding to graduating seniors pursuing a college degree, but without sufficient funds to afford their school of choice. MVYouth is currently supporting 18 students in college. “These students are terrific. They have been hardworking, excellent students, engaged citizens, and kind, compassionate individuals. 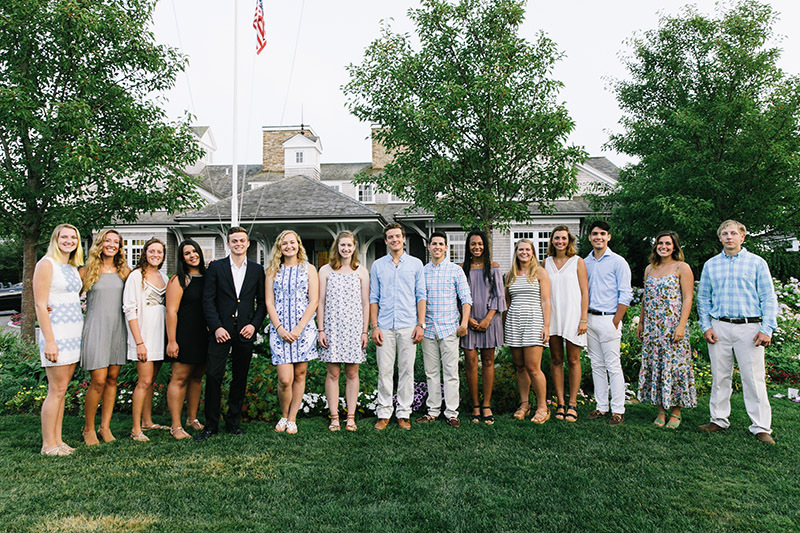 We are so proud to be supporting so many extraordinary Vineyard students to get excellent educations,” says Dan Stanton, co-chair of MVYouth’s board of trustees. A pilot program was established in 2017: workforce development scholarships. Workforce development scholarships support graduates of MVRHS Career Technical Education programs who are eager to join the local workforce, but need financial assistance to complete certification or training coursework required in their career fields. Graduates seeking careers in healthcare and the construction and landscaping trades were targeted. One student, Gavin Leuenberger, was selected in the pilot year. Gavin is beginning a two-year horticulture program at Northern Michigan College. The workforce development scholarship program will expand in 2018 to support multiple graduates of an expanded list of CTE programs. Deadlines for the 2017 expansion grant cycle are approaching. Letters of intent to apply are due Oct. 1. The application deadline is Oct. 15. The college scholarship and workforce development scholarship program deadlines will be in January. A community meeting will be held in October at the West Tisbury library to orient students and parents to the scholarship programs.